Never trash off orange peels again. Here is the best way to get the goodness of orange peel (naranga tholi/ orange tholi). Just try out this tangy, tasty pickle recipe. Orange peel pickle / pachadi or thokku is the healthy way to use orange peel which we usually trash off after eating orange. We all have the common habit of eating pickles as an accompaniment for rice. It's better to prepare pickles at home than store bought. And you know something...this orange peel has lots of health benefits which we neglect purposefully. It contains a good amount of vitamins like Riboflavin, vitamin B5, B6, minerals. It has almost 4 times of calcium than the orange fruit. So make use of this orange peel and don't trash it anymore. 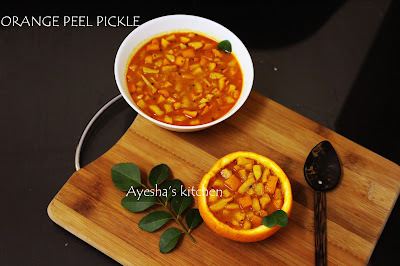 A healthy pickle recipe with orange peel/orange tholi.....it tastes best like mango pickle/lemon pickle. If you love pickles, u will definitely love this recipe. 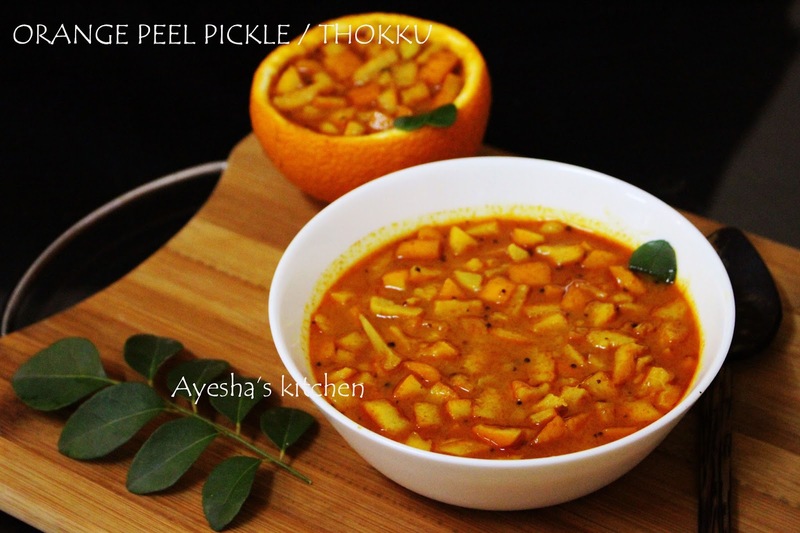 Here is the recipe showing how to make Kerala style Orange peel pickle / Thokku. Soak the tamarind in half a cup of water. If you are using vinegar instead, then skip this step. Sesame oil is used to prepare the pickles, only because it helps to increase the shelf life of pickles. If you do not have sesame oil, then just use normal coconut oil or any. Heat oil in a pan and when hot, splutter mustard seeds and then saute chopped ginger garlic. Saute until the raw smell goes, in a medium flame. Next, add some tsp of chilli powder to the oil and saute in a low flame. This is to get the nice texture only. Now add the chopped orange peel and give a fine mix. Saute for few minutes. Then add the spice powders along with salt and mix well. And if you prefer using tamarind, then add the tamarind pulp and let it get a boil. If you are using vinegar instead of tamarind, then add warm or hot water instead of tamarind pulp. Let it boils and cook well. Finally pour the vinegar, check for salt and mix well..
You can add curry leaves and remove from flame. Once cooled store in a clean, dry airtight container. It looks thin consistency..but will thicken once cooled. Our tangy spicy delicious orange peel achar/orange tholi achar/ orange peel tokku or pickle.